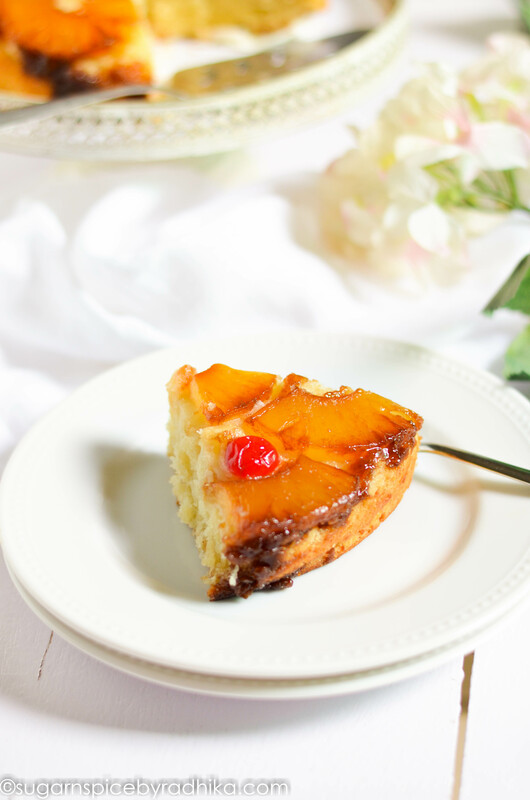 This classic tea-time cake is so fun to make and is one of my favourites! 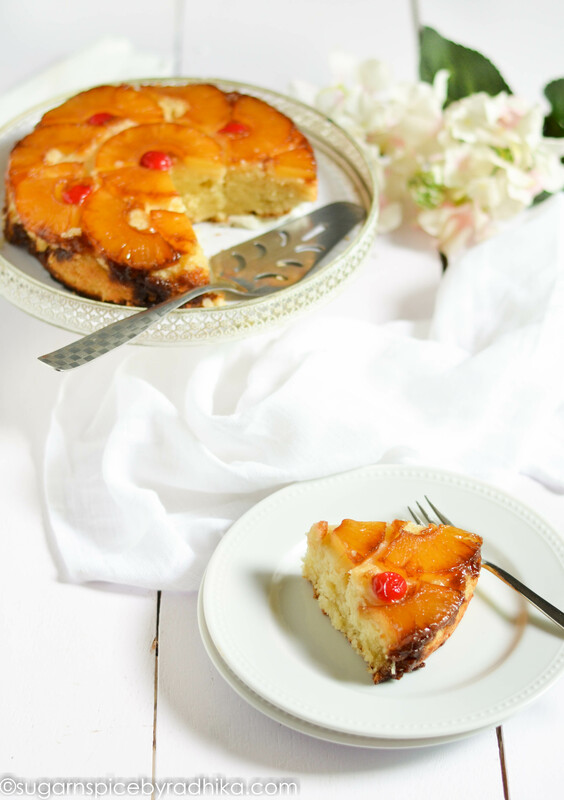 My Pineapple Upside Down Cake recipe is simple, easy-to-understand; and makes the fluffiest eggless cake! 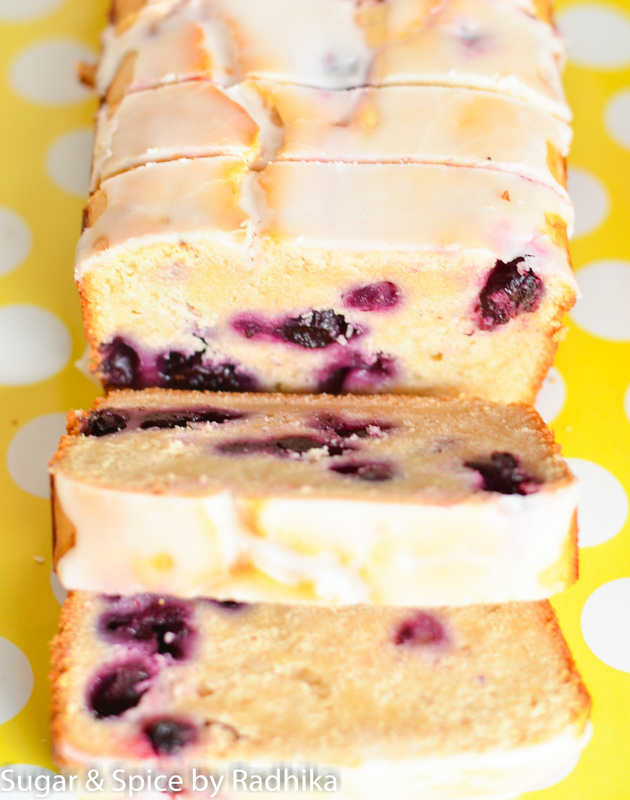 Tea time cakes are the best kind of cakes. I love them because they’re so easy and quick to make. I’ve never been a big fan of frosting anyway so tea cakes serve the purpose just right. But unfortunately I don’t bake them as much as I’d like to. Which is why when I saw another baker do a pineapple upside down cake recipe, it made me wonder why I hadn’t done one before. 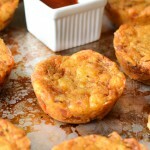 Its easy, relatively quick, and definitely delish. 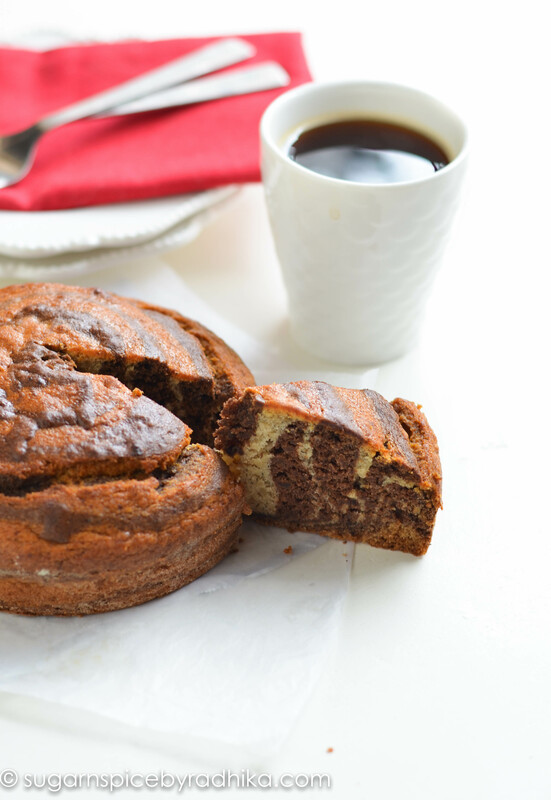 There was nothing stopping me so I baked it – 2 days in a row, and it tasted perfect both times. 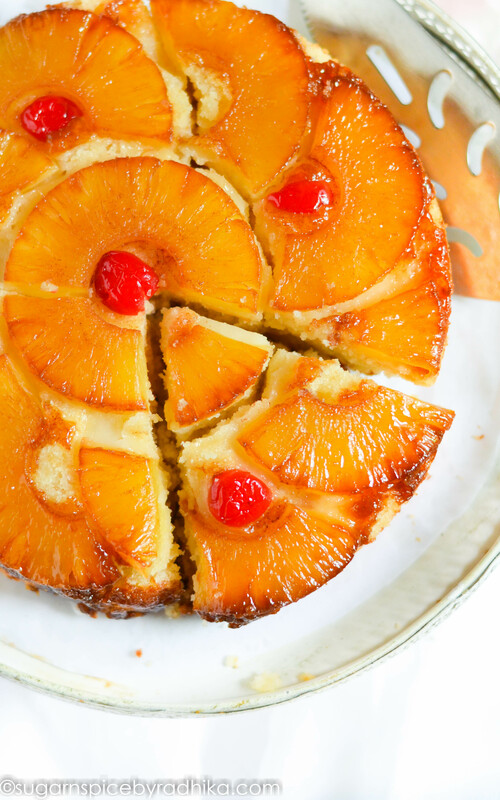 For a perfect pineapple upside down cake, there’s a little technique involved. Let’s discuss this “technique” in detail. Like I said, it’s nothing major but it sure is important. You start the process by lining the pineapple slices on the bottom of a tin (if its teflon coated you’re sorted) along with lots of melted butter and brown sugar. The butter and sugar is what caramelises the pineapple slices and gives them this beautiful color but it is also what could possibly make the pineapples stick to the pan (which btw did happen to me) if you either took it out too quickly or let it rest for too long. 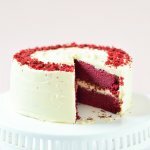 The technique here is flipping the cake out of the tin just in time. I usually wait for 10 minutes and take the cake out while it’s still hot but not piping. Most importantly, for the base of the cake I’ve used my favourite vanilla base recipe, it’s a classic vanilla sponge recipe that I’ve perfected over the years and it is the fluffiest cake ever despite being eggless. You must try it even if you’re a fan of egg cakes. This one will blow your socks off. 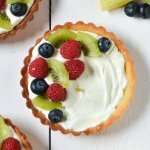 This recipe is simple and really fun to do, and I’ve mentioned even the smallest details so I’m sure you won’t have any problem following it. Do not be jerked by what may look like a lengthy recipe. I was in the mood to write so I have explained every detail. All Purpose Flour (maida), 2 cups or 250 grams approx. Softened Butter, ½ cup or 100 grams approx. Caster Sugar, ¾ cup or 150 grams approx. Pour the melted butter on the base of a 9" round cake tin. 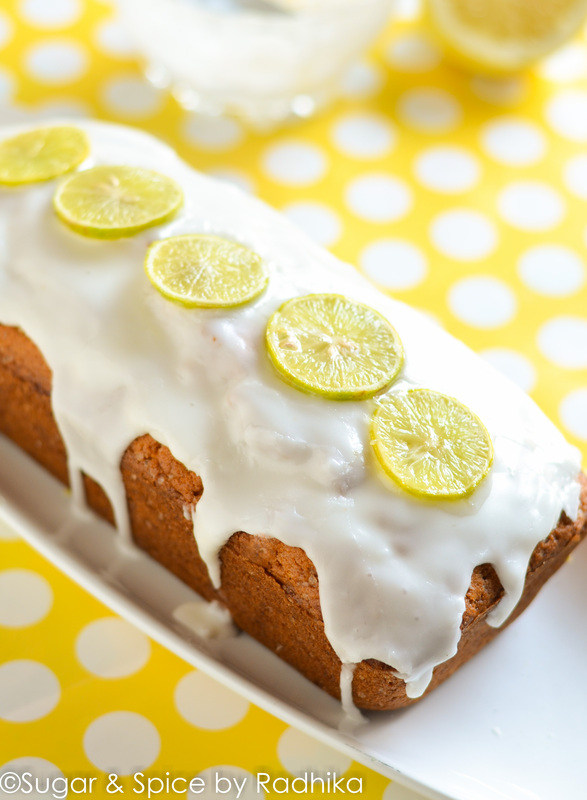 Cover the sides of the tin with the melted butter to make sure that the cake doesn't stick. Spread the remaining butter evenly on the base of the tin. Sprinkle the brown sugar on the base over the melted butter. Mix them slightly. It may look like there's a lot of butter but it's normal. Place a pineapple slice in the centre of the tin. Divide 4 slices in equal halves and start lining them around the central slice in a fan-like fashion. 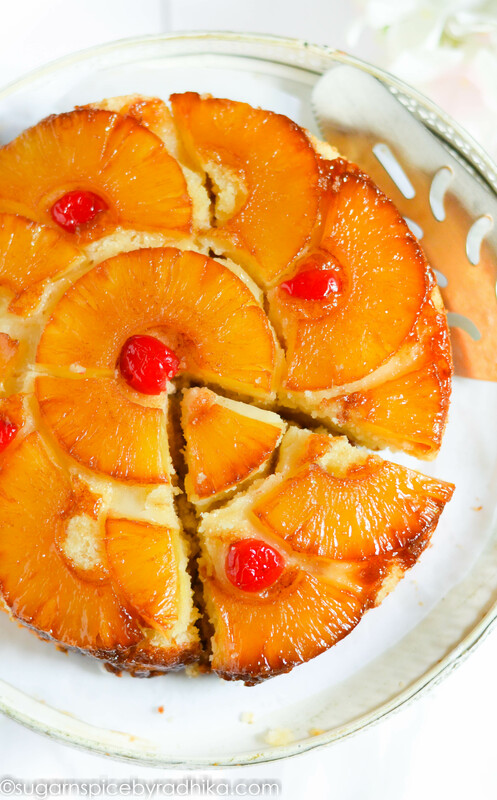 Place cherries in the centre of the pineapple slices, this is optional so don't worry if you cannot find cherries. Set it aside while you move onto making your cake batter. 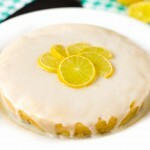 I used my Vanilla Sponge Cake recipe for the base, please read the recipe here. Prepare the cake batter according to the recipe. 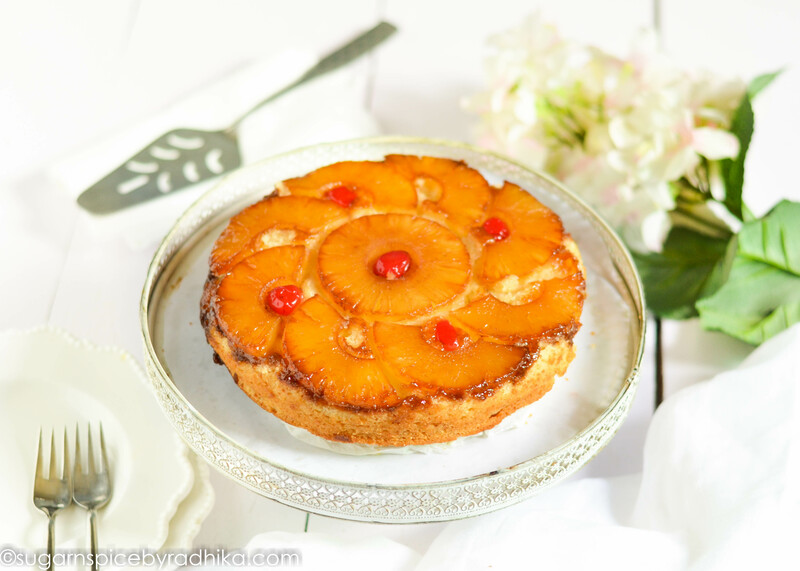 Once it is ready, pour it over pineapples and bake in a preheated oven at 180 degrees Celsius for 30-35 minutes. 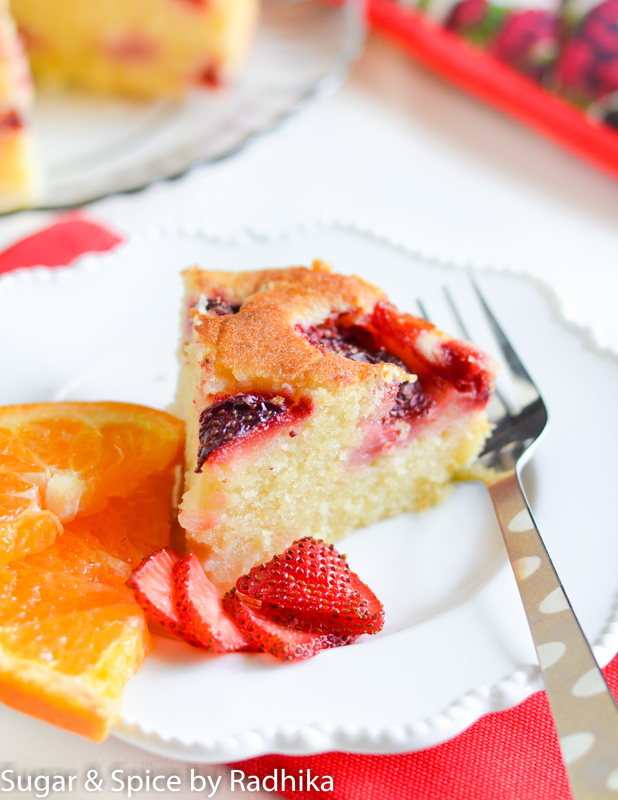 When the cake is ready, loosen the sides using a knife and let it cool down for 10 minutes before inverting it onto a cake platter or a large plate. This step requires a lot of patience, so please do not hurry. If you flip it without waiting, you may end up in a situation where your pineapple slices may stick to the pan. 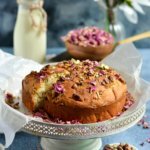 Let the cake cool down completely and enjoy with tea or coffee! This cake requires some skill, so if you're not a confident baker make sure you line the base of the cake tin with butter/parchment paper before beginning. This will ensure that your cake comes out of the cake without any problem. If by any chance your pineapples do end up sticking to the cake tin, do not panic. Just pick them and arrange them over the cake manually. 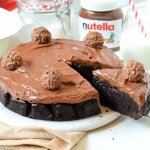 I usually check my cake to see if it's done after 30 minutes by inserting a wooden skewer or toothpick in the centre of the cake. If it comes out clean with a few crumbs that means my cake is ready, otherwise I bake for additional 5-10 minutes or until my cake is completely baked. 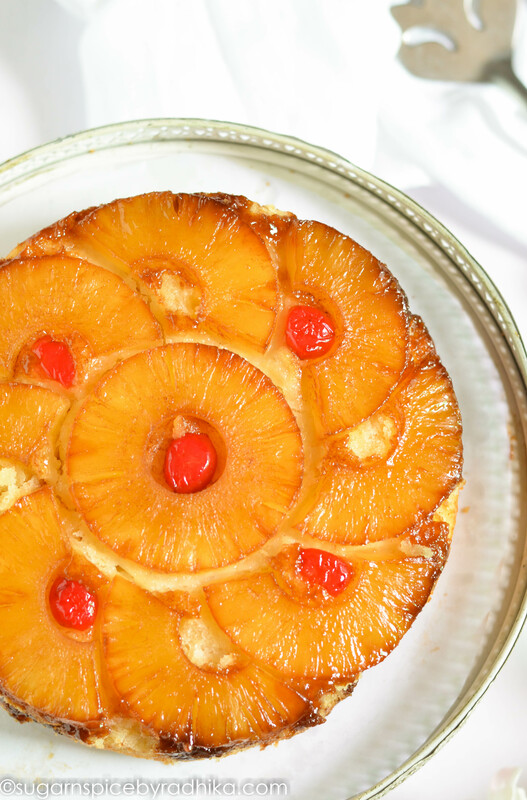 For this cake do not insert the skewer all the way to the bottom or you'll hit the gooey pineapples. Just insert it 1 inch deep. 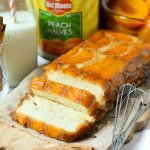 Looking for more cake recipes? Try these.. Anything for diet concious people?